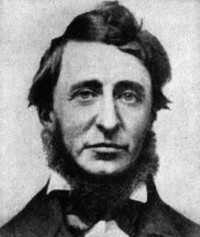 Henry David Thoreau (1817 - 1862) was an American writer who celebrated nature and independence; we know him best for his book, Walden, which chronicles two years of life he spent in a tiny cabin on the shores of Walden Lake, and for his essay, Civil Disobedience, works cited as powerful influences by no less than Mahatma Gandhi and Martin Luther King, Jr. Thoreau (which is pronounced "THUR-oh," by the way, not "thu-ROW") was a contemporary and friend of Ralph Waldo Emerson, Louisa May and Bronson Alcott, and Nathaniel Hawthorne; he lived his entire life in Massachusetts and was a graduate of Harvard. To learn more about him, visit www.thoreausociety.org. Suggesting we do not know much.